When life becomes one big juggling act, you've got to sub some of it out. I'll still hold some stock for my Magic workshops and for personal sales, but in general, someone else can package it all up and deal with the customers and yes, ok, I pay for that, but I think it's worth it. And yes, yes, I know Amazon pay little tax here in the UK, but I pay all mine and am only trying to maximise my sales, which will result in me paying more tax. I can't sort out global corporate problems. That's what facebook is for. So I'm basically trying to sub some of it out, without employing anyone on the books. 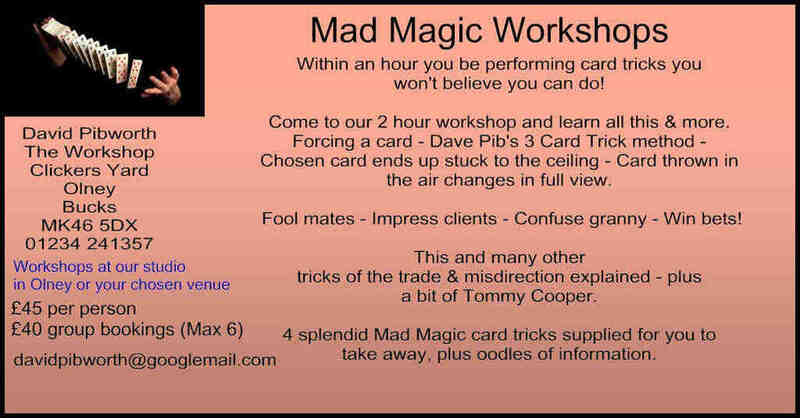 I run the magic sales and workshops, the mobile stage hire (where I do use self-employed help), the corporate acting stuff with a very good crew of professional - self-employed - actors, and go off acting and directing myself. I also oversee the rights for Tony Hancock and Steptoe and Son scripts, so what with one thing and another I thought I'd start to sub out everything I possibly can in my working life. Working with Amazon means that I will free up our downstairs office space in Olney and can let out some of it, so do let me know if anyone wants any office space in Olney; it's a highly desirable area and you know you'll have a lovely landlord. This will take a couple of months to get running I expect, but I feel it will leave me more time to do things that are important. But will it? I once tried playing golf and was ok at it. Hitting a little ball into a slightly larger hole is quite good fun occasionally, and a nice stroll, but I was surrounded by people who told me my golf clubs were wrong and if I was to progress to tournaments I would need to get rid of my Henry Cotton Leather Handled 1950's clubs, bequeathed to me by my late father in law. I had no intention of getting rid of them, or to progress to tournaments. I don't really care if I win at golf or not, so I thought that all in all, it would be easier to take the dogs for a walk. They don't nag at me, or ask me to join committees. I don't like the thought of bowls yet and I'm hopeless at darts and anyway, I don't drink alcohol so that cuts out most hobbies for the elderly. Also, as I said, I don't care if I win or not, which hampers any competition for my teammates. So I've decided to learn the drums. I play a little piano, uke and trumpet and I'd like to play most instruments a bit, so I shall. Each year I shall get a bit better at a specific musical instrument. Not enough to worry my jazz band, but enough to help if any of them get too drunk to play. But back to my subbing out campaign. The problem I have when I do manage to move some of my work on to someone else is that I always manage to get involved with another project which takes up the time I've saved. "I quite fancy a nice trip to the Carribean." The problem I have is that I enjoy most things I'm involved in, so it's never going to work perfectly is it? So I think what I shall do is to throw the juggling balls really high so that I have more time between them. It's a start anyway. I'll let you know how it goes.